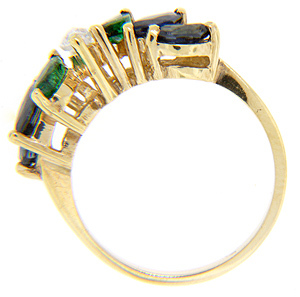 Seven marquis cut stones are set in a wave pattern on this 14K yellow gold vintage ring. 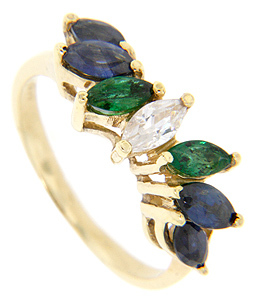 The outer stones on both sides are pairs of sapphires. Farther in two tourmalines flank a brilliant cubic zirconium. The ring measures 8.1mm in width. Circa: 1950. Size: 6 1/2. We can resize.